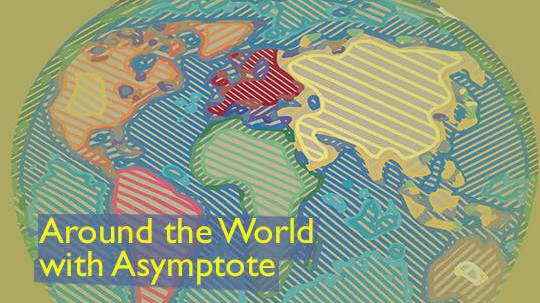 In case you missed it, Asymptote has exciting news from the London Book Fair, plus the latest literary gossip from Argentina and Canada this week. Lots of new books to look out for, and many writers making waves in their communities. First stop: LBF! Over the past few years, Polish has become the second most widely spoken language in the UK, so it was high time for Londoners to get exposed to a massive dose of Polish literature. Several years of work by the British Council, the Polish Book Institute and the Polish Cultural Institute in London finally paid off as Poland was the market focus at this year’s London Book Fair, held from 13 to 16 March. Polish writers kept popping up at readings and discussions—not just at the buzzing maze that is the Olympia conference centre, but also at venues all over London. However, the toast of the town was, without doubt, leading feminist author Olga Tokarchuk (Tok-ARCH-ook: TOK as in tick-tock, ARCH as in arch, OOK to rhyme with book, stress on the ARCH, to quote from the handy guide to pronouncing Polish writers’ names prepared by translator extraordinaire Antonia Lloyd-Jones). Apparently unfazed by her relentless schedule, Tokarczuk was always ready to answer probing questions with unfailing grace. Her conversation with novelist Deborah Levy at the London Review Bookshop sold out weeks in advance, and it must have been a real bonus for the author to be presented, ahead of its scheduled publication, with copies of her own latest book Flights, in Jennifer Croft’s English translation (excerpt here). Discussing the role of history in 21st century Polish fiction, Tokarczuk—whom moderator Rosie Goldsmith introduced as the “Margaret Atwood of Central Europe“—declared: “Objective history doesn’t really exist. What is located in the archives is just a collection of facts; history is a projection, our interpretation.” London-based Libyan author Hisham Matar concurred, suggesting that “all writing about the past is vigorously about the present.” Science fiction writer Jacek Dukaj pointed out that films and books can shape our own memory of events, while poet, writer, and translator Jacek Dehnel explained that he doesn’t write non-fiction because in literature you often have to lie to make it more true.